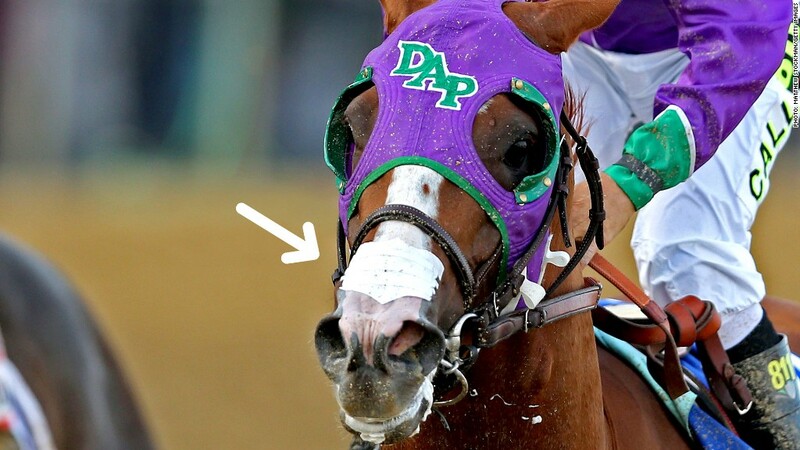 California Chrome won both the Kentucky Derby and Preakness Stakes wearing a Flair Equine Nasal Strip. 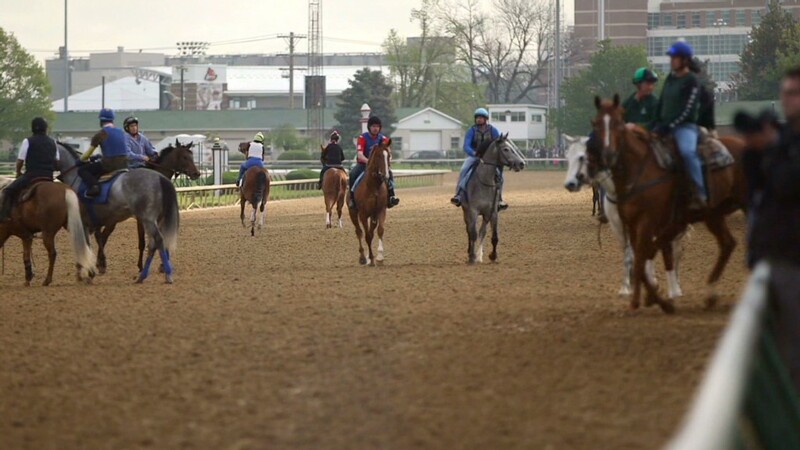 When California Chrome lines up at the starting gate of the Belmont Stakes on Saturday, veterinarians James Chiapetta and Edward Blach will be closely watching the nose of the Triple Crown hopeful. That's because when the three-year-old colt races, he almost always sports the equine nasal strip they invented. Their Flair Equine Nasal Strip, which helps horses breathe and reduce the chance of pulmonary bleeding, has attracted plenty of curiosity, and controversy, lately. California Chrome has worn the broad breathing strip in his last six wins, including the first two legs of the Triple Crown -- the Kentucky Derby and Preakness Stakes. New York previously banned the strips over concerns they had a performance enhancing quality. But the New York Racing Association recently lifted that ban ahead of its June 7 Belmont Stakes, the last of the Triple Crown races. "There were also concerns about how to deal with bettors," said Chiapetta. "What if bettors were expecting to see the strip on the horse and it fell off. Would that be unfair to them?" Now that the ban is lifted, Chiapetta and Blach feel validated. "I feel that now we've raised enough attention in the industry about the product and what it does for horses' health," said Chiapetta. "People are understanding the science behind it and are supporting it." But it has taken them 15 years to get to this point. The two met 30 years ago and soon became friends, bonding over their love of horses. "Ed was from a big ranch family in Colorado and I grew up in Minnesota with my family owning horses," said Chiapetta. Both eventually became equine veterinarians. Chiapetta recalls a phone conversation with Blach in the late 1990s that sparked the idea for equine nasal strips. "Ed wondered why no one had thought about nasal strips for horses," said Chiapetta. If it seemed like a random thought, it wasn't. In their respective practices, both would often stand next to horses as they ran on treadmills. "You get a whole different perspective about their health when you see them galloping from so close," he said. What they noticed was that when horses were running hard, the loose tissue around their nasal area gets sucked in, effectively narrowing the nasal passage and making it harder for them to breathe. "Unlike humans, horses only breathe through their noses when they are running," said Chiapetta. Taking in less air while running puts pressure on the animal's lungs, putting the horse at greater risk of pulmonary bleeding. "We thought a nasal strip could improve nasal air flow in a similar way to the nasal strips used by human athletes," he said. So in 1997 they approached CNS (the maker of Breathe Right nasal strips that was eventually acquired by GlaxoSmithKline) with a prototype and scored a licensing deal. CNS assumed the manufacturing of the nasal strips and paid Chiapetta and Blach a royalty. The strips debuted at the 1999 Breeder's Cup races and the 2000 Olympics but continued to be controversial as veterinarians questioned the efficacy of the drug-free strips. In 2001, Chiapetta and Blach spun off from CNS. They spent the next few years focused on manufacturing and marketing for their Delano, Minn.-based firm. "We wanted to clearly convey the message that our strips are intended to keep athlete horses healthy and not necessarily make them run faster," he said. In 2008, Chiapetta bought out Blach (who's currently the company's chief operating officer) and now co-owns the business with his wife, Michelle. Since then, the firm has acquired over 20 patents for its product and is the only maker of equine nasal strips in the country. Flair strips, which cost about $10.50 apiece, have been worn by horses that have competed in the Olympics and by 2012 Kentucky Derby and Preakness Stakes winner I'll Have Another. Chiapetta declined to disclose annual sales but said the firm is profitable. He said those profits are being reinvested into the firm as Flair looks to develop other drug-free products for horses. Neither Chiapetta or Blach have spoken with the owners of California Chrome. "Our business doesn't have any connections with his team," said Chiapetta. Yet, he will be watching the race in Belmont this Saturday. "I'm pretty sure Ed will, too." "It'll be very cool to see our nasal strip being used," said Chiapetta. "Hopefully the industry realizes that we are contributing something beneficial to the horse world."